I am student in the Scientific studies domain in Florence, Italy. 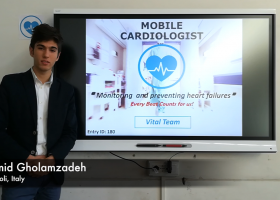 Actually, CEO and software developer of my project aimed to fight and reduce Cardiovascular diseases in the world. My international activities have born when I started cooperation with my teammate from Uganda, aged 18 too. This cooperation made possible the exploration of “developing countries” from the point of view of HealthCare and market opportunity. In my country I have support and collaboration with USL in (terms of providing Cardiologist contacts), the national Italian health care system. I had the possibility to interview several cardiologists (Glauco Magini) in order to know the views towards this project. I am a member of the Emergency rescue department developing feasible software solutions in order to improve rescue procedures in the region. I have been interviewed by an Italian television after participating as a winner in a European competition in the Netherlands. June 2018-EYE Volunteer in Strasbourg. I have taken part in “Smart E” conference in the International fair in Pisa, about Innovation perspectives in the Robotics. I met the head of “Italian National research center” in Pisa and get involved in a university environment. In January 2018, I have participated to the Diamond Challenge, a worldwide entrepreneurship competition in the USA, getting in touch with worldwide entrepreneurs of the program. In May 2018, applying to PeaceFirst competition in Boston, the project got selected and given a small aid for further developments and collaborations are still in action. Efforts, determination and receive “heart patients” smile is the key. Working for a better world is my (our) way. What is rewarding in such experience? Feeling the positive energy and patients happiness who see in the project a hope, for a better future. Passion is needed in everything I believe.